It's that time of year where the menu selections are packed full of fish entrees. whether you are a regular fish eater or only indulge during Lent, there are lots of health benefits that you may not be aware of. Fish is a great source of quality protein and is low in saturated fats. It provides a good source of omega-3 fatty acids which our bodies cannot produce on it's own. This fatty acid is found in all fish but are especially high in fatty fish like salmon, tuna, trout and even sardines (yuk!). Other fish that provide lots of omega-3 include sea bass, oysters, crab, perch, shrimp and cod. So you can see the choices are many and varied. The health benefits of fish don't stop just with a good source of omega-3 fatty acids and protein. Here are even more health benefits from fish. 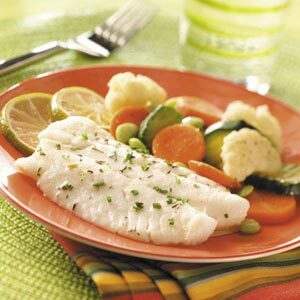 The high protein in fish helps regulate the blood sugar levels and makes this a great choice for diabetics. It is a low calorie, low carb food that helps you lose weight and maintain a balanced blood glucose level. I'm sure you remember your parents telling you to eat all your fish because it's good for your brain. Once again the omega-3 fatty acids provide nutrients that help with learning and concentration. Additionally people who eat at least one meal of fish per week are less likely to develop Alzheimer's disease versus those who never ate fish. With the low fat content and high protein source, fish makes the perfect food to add to your weight loss meals. It is filled with vitamins like riboflavin (B2) which helps you metabolize amino acids, fatty acids and carbohydrates. Other health benefits of fish includes prevention of osteoporosis. The vitamin D in fish helps absorb calcium keeping your bones strong. Additionally fish is full of calcium and phosphorus and is a fantastic source of minerals like zinc, iron, iodine, magnesium and potassium. Potassium is needed for your muscle, nerves and balanced fluids in your body. Eating fish has also been shown to reduce the risk of heart disease, stroke, depression and mental decline due to aging. Although some types of fish can have a high level of mercury, the benefits generally out weight he risks for most people. However, for children and pregnant women (or those that can become pregnant) there are certain risks and concerns. The U.S. Food and Drug Administration advises children and pregnant women (or those that may become pregnant) to avoid eating fish higher in mercury levels. The mercury level tends to be higher in older, larger, predatory fish like shark, swordfish, king Mackerel and tilefish. They can eat up to 12 ounces per week of fish that are lower in mercury such as canned light tuna, salmon, pollock and catfish. They also warn that you should check local advisories about the safety of fish caught by friends and family from local lakes, rivers and coastal areas. To get your health benefits of fish try these healthy fish recipes. Eating healthy can help you lose weight, reduce the risks of certain diseases and make you feel better. Check out these tips on eating healthy. Get up and get active with exercise. There are so many benefits of exercise that go beyond just losing weight. Get your health benefits from this fish dinner recipe. The fresh lemon flavor and juicy taste of this Tilapia filet will have your mouth watering for more. With only 6 points plus value, you will want to make this more than just once a week.